Prophet. Author. Poet. Conservationist. Radical. Mystic. Feature documentary film, directed by Michael M. Conti, produced with Heather Boyle (USA) 70 minutes. The Unruly Mystic:John Muir documentary film to premiere in Albuquerque, NM Filmmaker Michael Conti in attendance for talk back after screening. 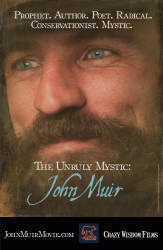 “The Unruly Mystic: John Muir” explores the remarkable life and influential works of a patron saint of environmental activism. The film discusses the connection nature and spirituality, using the life and wisdom of John Muir, ecological preservationist and founder of Yosemite National Park, as a catalyst for how being outside in nature affects the lives of everyday people right now. John Muir played many roles in his life: mystic, prophet, author, poet, conservationist, radical, all of which helped him succeed in his role as an advocate for Nature. As America’s most famous naturalist and conservationist, Muir fought to protect the wild places he loved, places we can still visit today. Muir’s writings have profoundly shaped the ways in which we understand and envision our relationship with the natural world today, and his work has become a personal guide into the natural world for countless individuals. The film interviews noted psychiatrists, therapists, theologians, writers, and every day people and asks them to discuss their relationship with nature, and its transformative effect in their lives. Every generation when finding its own voice also rediscovers the teachers, mystics, geniuses, misfits, rebels, troublemakers from the past. These films are the filmmaker’s gifts to remind us of those previous unruly mystics who stood strong, brave, open and everlasting awake, and who continue to inspire and challenge the status quo. Crazy Wisdom Films are rich in detail and inspire us through stories of others to discover our own remarkable potential. Each film is crafted to be appealing to a multi-generational audience, from the twenty something-spiritual seekers to the gray-haired elder who seeks a deeper wisdom on the subject. The films remind us of the common good and universal connection that we have to the earth and to spirit, and that connection that those are stronger and deeper than merely one nation, religion, race, class or gender.